Cook pasta to desired doneness as directed on package. Drain. Rinse with cold water. 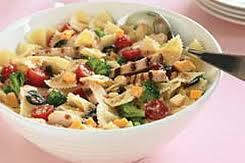 Place cooked pasta in large bowl or plastic container. Add chicken, celery, salt, peas, mushrooms and dressing. Toss gently. Refrigerate until serving time. Add cashews. Toss gently. Serve in lettuce lined bowl. Makes about 20 (1 cup) servings. (1/2 of this recipe would still make a large salad).